Today if I shift my weight on the left leg, and bend the knee forming a 40-something degrees angle, I can clearly feel a tremble and a slight pain in the frontal-lower part of the knee, where the tibia (or shinbone or shank bone) and fibula (or calf bone) are connected. Or maybe the posture. “Posture is very important” said the police officer inspecting the home of Eduard Norton in The 25th Hour, a great scene in the video here. If you haven’t clicked away yet, I can tell you that this light pain is actually a good news at the perfect timing. Flashback to 11 years ago, to my previous motocross life (I don’t know why I keep mentioning this on the blog, after I haven’t spoke about it with anyone for ages!). Even if I was driving extremely safe, constantly in the last raws of the races, leaving everyone else fighting in the mud, crashing motorbikes, breaking bones and hospitalizing themselves every Sunday, I could not avoid to collect an physical heritage from those years. A little gift to keep as a memory, to remember me that yes, I did it, I was a cool kid racing motocross bikes before becoming an IT consultant! 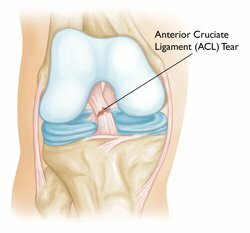 My heritage is a damaged anterior cruciate ligament (ACL) on my left knee, caused by a stupid accident loosing control of the bike. Damaging a ligament goes like this: a terrible pain makes you scream for a while, pretty quickly (luckily) it fades away, then the idea you can soon walk again cross your mind but soon after the knee swells so much that for few days there’s no mobility. Till the swell is over nothing can be done or checked. So when I had this first accident, I waited diligently over a month, a month in which Mario – my close friend back then colleague – acted as my personal chauffeur. We were the diabolic duo – the crippled cat and the limping fox of the local IT scene. So, age 21, I (well, “the family”) decided against Doctors advise to take the risk and carry on. I just adapted not to trust my left knee. Not landing a jump on him. Not overextending him. It all worked out on a deeper and deeper unconscious level. Till I forgot about it. I then started skiing, skating, and then running. And running. And running. Till I run a full marathon. And then kite surfing. And sometime I was thinking “and they wanted to operate me! Ah!”. I could not imagine that one day, after walking in the Colombian jungle of Sierra Nevada for 5 days, 100% humidity and 30+ Celsius, the Doctors would prove themselves right. There I was, after jumping a log on the way and landing on my left leg, screaming and telling everyone “don’t worry I know the problem!”. Only 2 differences are that the ligament is now broken instead of damaged, and the Doctors are Dutch instead of Italians. Even if I had tragicomic experiences with Dutch health care system, this time I surrender, I abandon myself to their plans. The first step, in little more than a week, will be an arthroscopic surgery to “have a look” (in Dutch “even kijken” reason why they call it “kijkoperatie”) inside the knee. Just in time to be crippled for New Years Eve, but I don’t like New Years Eve anyway, and then I’ll start with the physiotherapy. If everything is confirmed, I’ll have in few months the ACL reconstruction and the physiotherapist will become my best friend in 2012. So why is a good news that today my knee hurts? Because even with the broken ligament I had no problem, so I was really doubting if it all made sense. your chinese friend is asking you: knee how? Amazing store, Daniele! The body will adapt to just about anything, so also a damaged ligament. You’re brave to face the whole circus of repairing the -now broken – ligament. Good luck!!! Daniele, great blog, and I love your description of the Dutch health care system, which is quite hilarious (and also unfortunate).